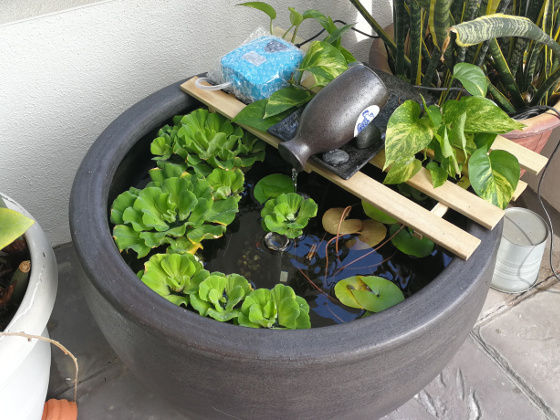 Anself Solar Powered Pond Aerator – A review on an air pump for small pond aeration | My Goldfish Is Alive! I think one of the mistakes I made when renovating my home 6 years ago was not to include a power outlet at my porch area. This is where I eventually placed my small pond (~20 gallons) which in reality is a pot pond but hey! it’s a small pond nevertheless. I bought some of these aerators online, and they are basically water pump fountains which operate only when the sun is up. Well…they are all OK… but are only operational for a limited period of time. I wanted to add another one which can operate longer through the day. After all, who has ever complained about too much aeration, right?… well, unless maybe for a planted tank. Besides that, although my pot pond is already cycled, I wanted to add a sponge filter to it so that it can get continuous mechanical and biological filtration. I do have some guppies living in that pond. So something like an air pump that can power up the sponge filter would be great! 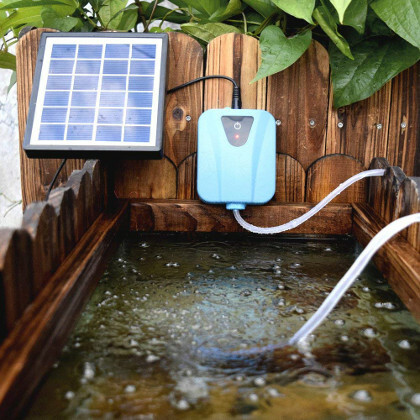 Then I came across this product – Anself Solar Powered Pond Aerator Air Pump. It looked as if it will satisfy all my needs. Well, it’s solar powered, so that’s one check. It’s an air pump and I can definitely use my sponge filter with it, so that’s another check! Even without the user manual, this product is very easy to assemble. You attach the air tube with air stone at the bottom of the pump, and the power source (i.e. 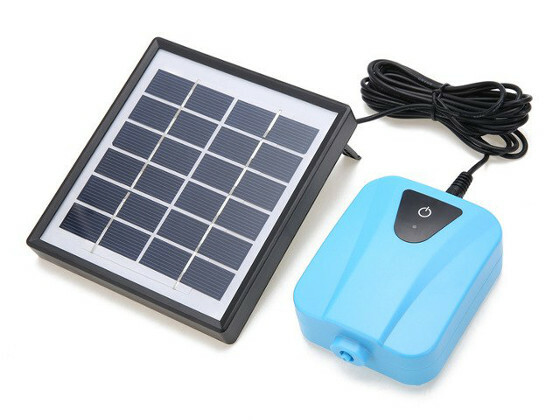 the solar panel or USB cable) at the top of the pump. Start & Stop: To start or stop the air pump, press and hold the power button for 2-3 seconds. Change Airflow Mode: After the air pump is started, short press on the power button will switch to different airflow modes i.e. continuous airflow and intermittent airflow. Intermittent airflow here means a cycle of 8 seconds of air flow, then stop for 2 seconds. As with any solar powered products, they will work as long as there’s sunlight. 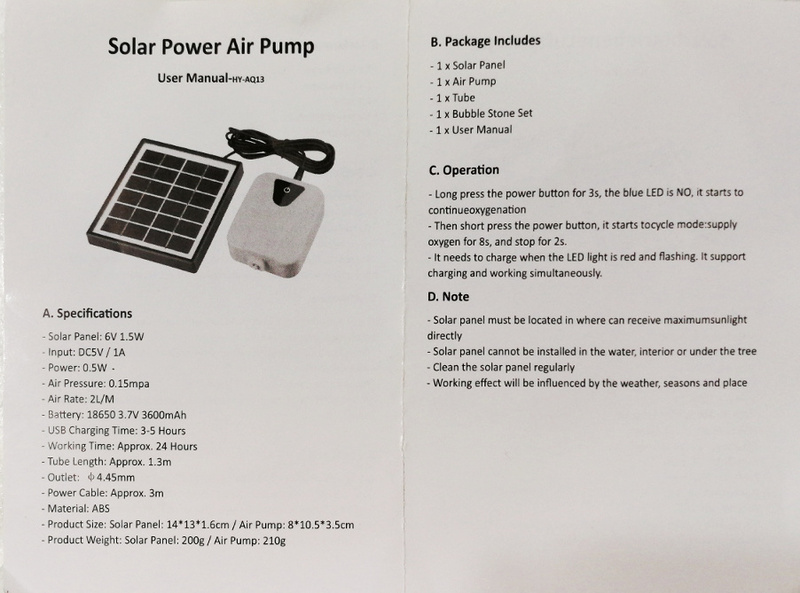 This is no different for Anself solar powered air pump. It will continue to work as long as there is a source of power either via the solar panel or via the USB cable (in the video above, I got that connected to a power bank). Seriously, very little sound from the air pump when it’s in operation. 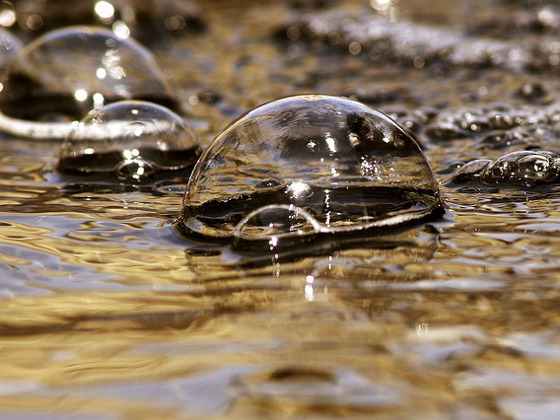 The only sound I get is from the bubbles that it created. I am using this air pump with a sponge filter for my pot pond. It provides a strong airflow of 2L/min for the size of my pond which is around 20 gallons. With this rate, it is suitable to aerate up to 60 gallons of water. 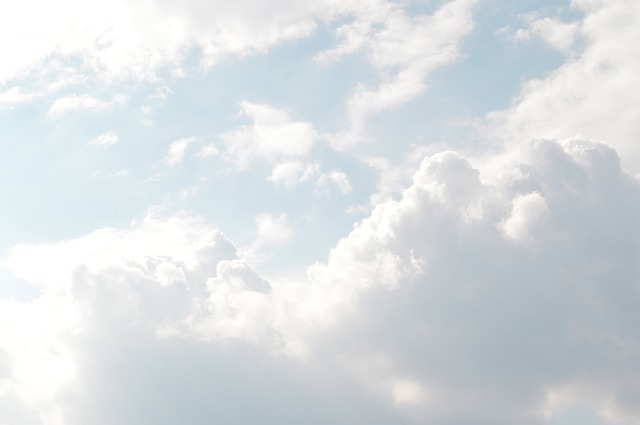 As mentioned above, there are 2 modes for airflow – continuous and intermittent. It’s always a good thing to be provided with options, right? The intermittent mode here will use up less power, thus enabling the air pump to run longer. 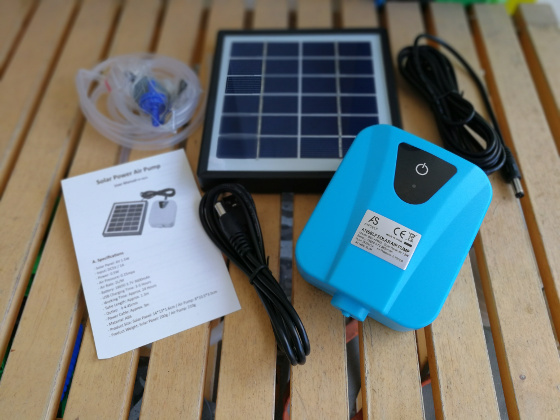 There are a lot of interesting functions on this Anself Solar Powered Pond Aerator Air Pump, but what attracted me most to it is that it comes with a built-in lithium battery. Let’s see why that matters. What this means is that there is a rechargeable battery that can power up the air pump when there’s no sun or when it’s not connected to any power source via the USB cable. This is really exciting… as it will mean that I can get my air pump to work at night too!…. but is it really so? Well, let’s first look at how well this lithium battery can be charged. The battery can be charged via the solar panel or via the USB cable. 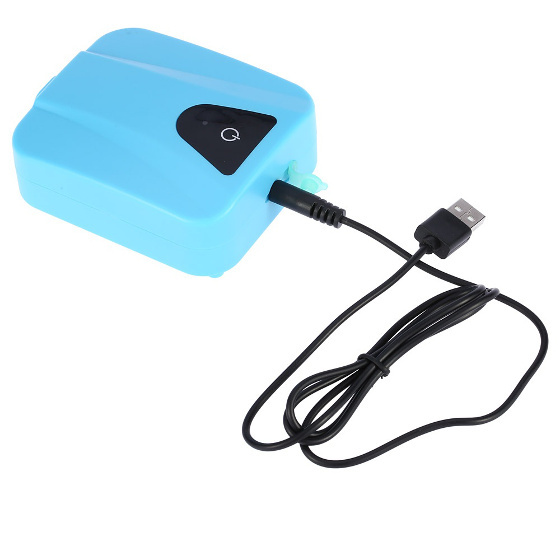 Of course, if you have your air pump running during that time, the charging will be slower as compared to stopping the air pump and just let the battery charges. The LED light indicator on the air pump will flash in red during charging and when fully charged, it will show solid red. If you detach the source of power after charging, you will see that the light becomes solid blue. This battery capacity is 3.7V / 3600mAh and it will take around 4 hours to fully charge it via USB cable. With this method, my experience is that the fully charged battery could power the air pump continuously for 24 hours. When I try depending on the sun to charge this battery, well.. it charges really slow and feels like forever. Seriously! I supposed this also depends on how much sunlight that you get hitting the solar panel. I never had any luck getting it to fully charge that way. Anyway, when I leave it under the sun for the whole day, I could only get it to power the air pump continuously for 2-4 hours. This may have something to do with the size of the solar panel provided. 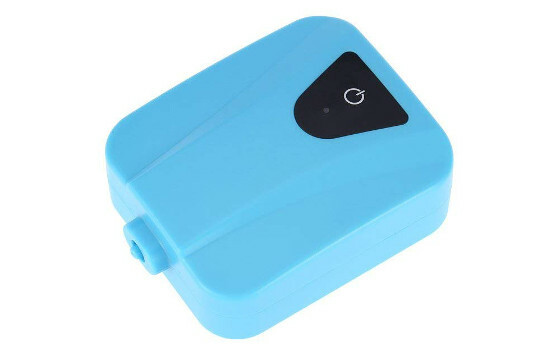 So in short, if you are expecting this Anself solar powered pond aerator air pump to work continuously 24/7, you are up for a major disappointment! So I lowered down my expectation and resorted to restarting the air pump manually from time to time. 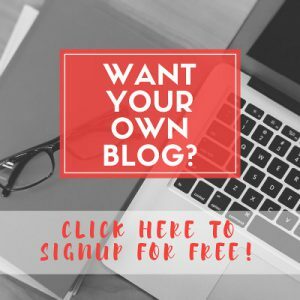 “It’s a cheap product after all”, that’s what I keep reminding myself. Anyway, I do see this product being very useful as a backup air pump in the case of power cut, or for the purpose of aeration when transporting fishes. If you are like me and do not mind restarting the air pump manually, you can still use it in your small pond. “It’s a cheap product after all!”.